It's just too hot for exploring; we try and try, but the AC in the car isn't very good and I just end up weird & cranky, or as Kim would say, "weirder and crankier." So it was a nice consolation to see Michael Wallis on the Colbert Report last night. No, not the 60 Minutes guy, that's Mike Wallace. I'm talking about the man who wrote such great books as Billy the Kid: The Endless Ride, Way Down Yonder in the Indian Nation: Writings from America's Heartland, and Pretty Boy: The Life and Times of Charles Arthur Floyd. That Michael Wallis. He's written a new book called The Lincoln Highway: Coast to Coast from Times Square to the Golden Gate. 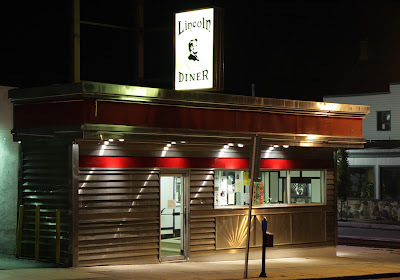 The Lincoln Highway is one of the great old U.S. Highways we like to go on about here at Falmanac, and we are very glad to see something new on the subject (other than the oh so tired Route 66). I haven't read this one yet, but I did read the other three mentioned above, and on that evidence alone, I'll rate Lincoln Highway as Highly Recommended.